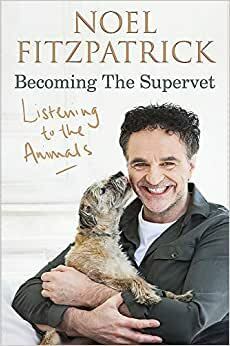 In this inspiring, uplifting and heart-warming memoir, world-renowned veterinary surgeon Professor Noel Fitzpatrick explores his journey to becoming The Supervet. Start reading Listening to the Animals: Becoming The Supervet on your Kindle in under a minute. 5.0 out of 5 starsCouldn’t put it down, didn’t want it to end. I was hooked from the start with this incredible story of an amazing human being. Professor Noel Fitzpatrick had a very difficult life. He overcame incredible cruelty, violence and isolation to become such a loving caring Supervet despite all that he had to endure. You will laugh and you will cry, you will love the photographs. Most of all you will fall in love with this incredibly beautiful soul. Truly a gift from God. Love this man's compassion for the animals he treats, and their humans. Could have been shorter in some areas but Noel is a very special and influential vet. This was a gift having read the book when it first came out in October. Lovely man, well written and had me in tears and laughter throughout. Well worth reading if you are a Noel Fitzpatrick fan. 5.0 out of 5 starsSupervet - Super book! James Herriot's books were among the first memoirs I read many years ago. Since then I've read a few more of this type of book, and recently 3 on the trot. Noel Fitzpatrick's book was wonderful and certainly lived up to all expectations. He relates his family story, and circumstances which made him desire to become a vet. The book starts with his childhood in Ireland. At the age of 10, he's already dealing with lambing. He lives on a farm, it's the norm. Farming was in the family-his father, his father's father, etc. Even at this early age, he's an old hand at this sort of thing. He's been dealing with birthing since about two years previous. Oh my, already my emotions were involved. The first chapter left me breathless. This was so well written. Lovely anecdotes from his early life, told with warmth and humour. Some of it is very hard circumstances; farm life, the inevitability of things for the cows and sheep. Filled with both happy memories, and hard times. From those hard beginnings in Ireland, how far he has come. He hadn't been a top of the class student-far from it, things didn't come easy for him. But work, work, work he did. I've only seen Noel Fitzpatrick in brief spats on TV, in between work etc. My mum watches him and has quite a soft spot for him. So I was coming to his book not really knowing much about him. I absolutely loved it! A wonderful read. 5.0 out of 5 starsGreat insight into this amazingly clever and humorous man. I love this book by Noel Fitzpatrick a surprise in every page and a wonderful insight into a more than lively mind. I have loved him in his series The Supervet but to find him so multi talented was amazing....were does he get the energy from. Great job Noel love your work. Just a great read in an age where horrible things happen all the time. A journey of how to overcome adversity and not let it rule your life.